PARIS --- The Italian government stopped payments to the F-35 program in early 2018, leading Lockheed to stop its deliveries and withhold at least two aircraft, which are currently sitting at the Italian Final Assembly and Check Out facility in Cameri, Italy. In addition, Lockheed has also suspended all dealings with Italy, and has asked the F-35 Joint Program Office to do the same. 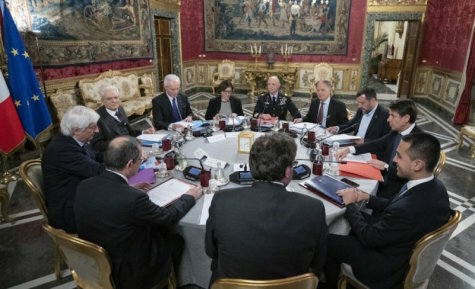 The revelations come as the Italian government, which took office on June 1, continues to review its defense programs, with a special emphasis on the F-35, from which one of its coalition parties, the Five Stars Movement, promised to withdraw, while the other seems content to continue at a slower procurement rate. They also coincide with the completion of an extended review of Italy’s participation in the F-35 program. That report, over six months in the making, has now been handed in to Prime Minister Giuseppe Conte, who after considering its contents is expected to renegotiate Italy’s participation with President Trump during his forthcoming visit to Washington. The suspended payments and deliveries were not made public by the Italian government or Lockheed, and only came to light after March 12 testimony by Gen. Alberto Rosso, the Italian Air Force chief of staff, to a joint session of the Lower House and Senate defense committees. “Outstanding invoices issued in 2018 and not yet paid by Italy amount to 389 million euros,” he said, adding that “to date, 28 aircraft have been authorized at a political level; we have received eleven and a half, and now we are waiting” to see what happens,” Rosso said. He also expressed "major concerns about uncertainty about the program" and the "hypothesis of a quantitative reduction" in the number of aircraft that Italy will ultimately buy. One of the two undelivered aircraft is an F-35B/STOVL registered “BL-2” (MM7452, BuAer 169599) and built as part of Low-Rate Initial Production Lot 10; it made its first flight on Oct. 15, 2018 at Cameri and should have flown to Beaufort MCAS, in South Carolina. The second is the F-35A/CTOL registered “AL-11” (MM7361/32-11, s/n 17-5287), the only Italian aircraft in Lot 11. It made its first flight on Oct 16, 2018 also at Cameri, and should have been flown to Amendola air base, in southern Italy. "We will pay these 389 million…. and then we will stop to proceed with the re-discussion of the program," Lettera 43 reported March 12 quoting unidentified government sources, as "some doubts remain about the program, and therefore it will be reviewed, as has already been announced on several occasions." According to La Stampa, the money – it says €370 million – has been sitting in an Italian government account with the Washington branch of the Intesa Sanpaolo bank for about a year because the Italian Ministry of Defence never ordered it to be paid to Lockheed. “We will immediately pay what is owed. In a few days, [Defense] Minister Elisabetta Trenta will sign the decree authorizing the payment,” La Stampa reported March 12 quoting an unidentified defense ministry official. Other sources say the payment was blocked by the Five Stars party to which Trenta belongs, pending a review of Italy’s participation in the F-35 program, which La Stampa reports has now been handed over to Prime Minister Giuseppe Conti, who will decide how to proceed. Nothing is yet known about the contents and conclusions of the review, but the government's will to review Italy’s participation in the program remains unchanged. It will have to be discussed at presidential level Italian Premier Giuseppe Conte and Donald Trump. Soon after taking office, Defense Minister Elisabetta Trenta said during her first TV interview on July 6 that "We will not buy any other F35s; we are considering whether to maintain or cut existing contracts…..We have always been critical of the program, nobody has hidden it," she wrote in a post on her Facebook account, and "for this reason we will not buy any new fighters and, in light of the contracts already signed by the previous executive, we are carrying out a careful evaluation that takes exclusively into account the national interest."